Today wasn’t a good crafting day. The faucet handle on the kitchen sink has been loose for a while. Rick and I couldn’t figure out how to tighten it up. This morning I was sure it would just break off, so I called the plumber. He said he could be right out, so I looked around the kitchen and asked for a few hours to clean up. I spent all morning putting things back where they should be and scouring everything. Why I feel the need to clean for the plumber, but not my family, I will never understand. It was only an anchor bolt that needed tightening, so the bill wasn’t much and I had a nice conversation. The plumber has 4 daughters and a fifth baby he hopes is a boy on the way. 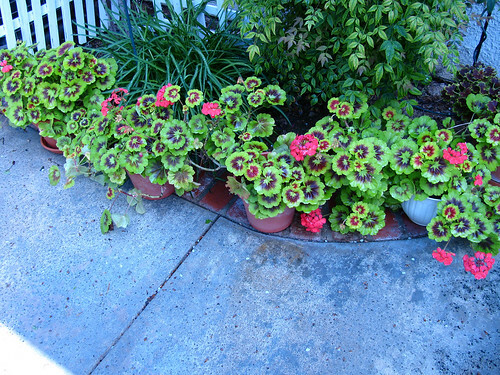 I asked him if he thought about how hard it would be on a boy to have 4 older sisters telling him what to do…………… I am not going to share a photo of my sink, so after the rain stopped I took a photo of my baby geraniums. 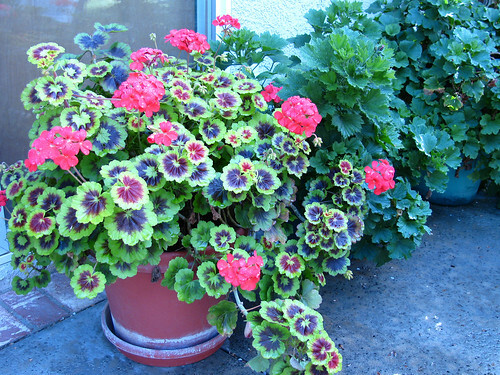 Last summer whenever a branch broke off my big red geranium I stuck it in water or a pot of soil. They grow both ways. This spring my patio is lined in geraniums. I am so proud of them and my clean kitchen. Here is the mother plant as big as ever. In back are some overgrown Martha Washington geraniums that I need to find bigger pots for. This entry was posted on Thursday, April 9th, 2009 at 3:00 am and is filed under Garden and Life. Tagged: Garden, Life. You can feed this entry. You can leave a response, or trackback from your own site. Your geraniums are lovely! I just got a vining geranium w/ bright pink blossoms.